This section describes the MySQL Installer product catalog and the dashboard. The product catalog stores the complete list of released MySQL products for Microsoft Windows that are available to download from MySQL Downloads. By default, and when an Internet connection is present, MySQL Installer updates the catalog daily. You can also update the catalog manually from the dashboard (described later). The Custom setup type during the initial setup. The Add operation from the dashboard. Identifies when product updates are available for the installed products listed in the dashboard. The catalog includes all development releases (Pre-Release), general releases (Current GA), and minor releases (Other Releases). Products in the catalog will vary somewhat, depending on the MySQL Installer release that you download. The MySQL Installer dashboard is the default view that you see when you start MySQL Installer after the initial setup finishes. If you closed MySQL Installer before the setup was finished, MySQL Installer resumes the initial setup before it displays the dashboard. Add: This operation opens the Select Products and Features page. From there, you can filter the product in the product catalog, select one or more products to download (as needed), and begin the installation. For hints about using the filter, see Locating Products to Install. Modify: Use this operation to add or remove the features associated with installed products. Features that you can modify vary in complexity by product. When the Program Shortcut check box is selected, the product appears in the Start menu under the MySQL group. Upgrade: This operation loads the Select Products to Upgrade page and populates it with all the upgrade candidates. An installed product can have more than one upgrade version and requires a current product catalog. MySQL Installer does not permit server upgrades between major release versions or minor release versions, but does permit upgrades within a release series, such as an upgrade from 5.7.18 to 5.7.19. Upgrades between milestone releases (or from a milestone release to a GA release) are not supported. Significant development changes take place in milestone releases and you may encounter compatibility issues or problems starting the server. For upgrades to MySQL 8.0.16 server and higher, a check box enables you to skip the upgrade check and process for system tables, while checking and processing data dictionary tables normally. MySQL Installer does not prompt you with the check box when the previous server upgrade was skipped or when the server was configured as a sandbox InnoDB cluster. This behavior represents a change in how MySQL Server performs an upgrade (see What the MySQL Upgrade Process Upgrades) and it alters the sequence of steps that MySQL Installer applies to the configuration process. If you select Skip system tables upgrade check and process. (Not recommended), MySQL Installer starts the upgraded server with the --upgrade=MINIMAL server option, which upgrades the data dictionary only. If you stop and then restart the server without the --upgrade=MINIMAL option, the server upgrades the system tables automatically, if needed. Click Upgrade. Confirm that the check box next to product name in the Upgradeable Products pane has a check mark. Deselect the products that you do not intend to upgrade at this time. For server milestone releases in the same release series, MySQL Installer deselects the server upgrade and displays a warning to indicate that the upgrade is not supported, identifies the risks of continuing, and provides a summary of the steps to perform a logical upgrade manually. You can reselect server upgrade at your own risk. For instructions on how to perform a logical upgrade with a milestone release, see Logical Upgrade. Click a product in the list to highlight it. This action populates the Upgradeable Versions pane with the details of each available version for the selected product: version number, published date, and a Changes link to open the release notes for that version. 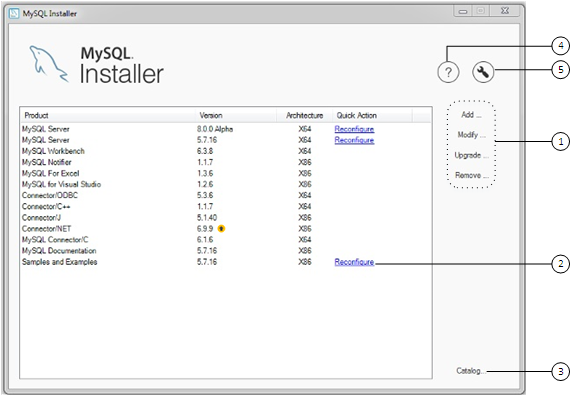 MySQL Installer upgrades all of the selected products in one action. Click Show Details to view the actions performed by MySQL Installer. Remove This operation opens the Remove Products page and populates it with the MySQL products installed on the host. Select the MySQL products you want to remove (uninstall) and then click Execute to begin the removal process. Select the check box for one or more products. Select the Product check box to select all products. The Reconfigure link in the Quick Action column next to each installed server loads the current configuration values for the server and then cycles through all configuration steps enabling you to change the options and values. On completion, MySQL Installer stops the server, applies the configuration changes, and restarts the server for you. For a description of each configuration option, see Section 1.3.3.1, “MySQL Server Configuration with MySQL Installer”. Installed Samples and Examples associated with a specific MySQL server version can be also be reconfigured to apply feature-configuration changes, if any. You must provide credentials with root privileges to reconfigure these items. The Catalog link enables you to download the latest catalog of MySQL products manually and then to integrate those product changes with MySQL Installer. The catalog-download action does not perform an upgrade of the products already installed on the host. Instead, it returns to the dashboard and displays an arrow icon in the Version column for each installed product that has a newer version. Use the Upgrade operation to install the newer product version. You can also use the Catalog link to display the current change history of each product without downloading the new catalog. Select the Do not update at this time check box to view the change history only. The MySQL Installer About icon ( ) shows the current version of MySQL Installer and general information about MySQL. The version number is located above the Back button. Always include this version number when reporting a problem with MySQL Installer. Product Catalog: Manages the daily automatic catalog updates. By default, catalog updates are scheduled at a fixed hour. When new products or product versions are available, MySQL Installer adds them to the catalog and then displays an arrow icon ( ) next to the version number of installed products listed in the dashboard. Use this option to enable or disable automatic catalog updates and to reset the time of day when the MySQL Installer updates the catalog automatically. For specific settings, see the task named ManifestUpdate in the Windows Task Scheduler. Connectivity Settings: Several operations performed by MySQL Installer require internet access. This option enables you to use a default value to validate the connection or to use a different URL, one selected from a list or added by you manually. With the Manual option selected, new URLs can be added and all URLs in the list can be moved or deleted. When the Automatic option is selected, MySQL Installer attempts to connect to each default URL in the list (in order) until a connection is made. If no connection can be made, it raises an error. MySQL products in the catalog are listed by category: MySQL Servers, Applications, MySQL Connectors, and Documentation. Only the latest GA versions appear in the Available Products pane by default. If you are looking for a pre-release or older version of a product, it may not be visible in the default list. To change the default product list, click Add on the dashboard to open the Select Products and Features page, and then click Edit to open the filter dialog box (see the figure that follows). Modify the product values and then click Filter. Category: All Software (default), MySQL Servers, Applications, MySQL Connectors, or Documentation (for samples and documentation). Maturity: Current Bundle (appears initially with the full package only), Pre-Release, Current GA, or Other Releases. The Commercial release of MySQL Installer does not display any MySQL products when you select the Pre-Release age filter. Products in development are available from the Community release of MySQL Installer only. Already Downloaded (the check box is deselected by default). Architecture: Any (default), 32-bit, or 64-bit.